Welcome to the Customer Support FAQ wiki for Roll20.net - this FAQ contains the most common issues or questions reported by Roll20 users. If you are having trouble with any aspect of our site, check this wiki first before heading to the forums. 5 Comments, Concerns, Questions, or Suggestions? You may be using an incorrect email address. Search your other inboxes for a "Welcome to Roll20" email - one was sent to you when you created your account. If you are still unable to log in, email us with any additional email address, your user name, or a link to your profile. Still waiting for your password reset email? Issues with our password reset usually occur because of either an addon that is interfering (such as Adblock), or because you may have "third party cookies" disabled. Follow the steps on our Solving Technical Issues wiki or check out this PDF on how to enable "third-party cookies" in your web browser, then try our password reset link again. Please note that many smartphone browsers are not compatible with the password reset page, and so you will need to use a desktop web browser. If the steps above do not work, please email us from the email attached to your Roll20.net account. Please email us from the email attached to your Roll20.net account with the name of the game you would like un-deleted. The only way to recover a portion of an existing Game is through a Rollback. Rollbacks are a Pro Subscriber feature only, so please be careful when deleting things from your game! If you experienced a loss of data caused by an error or other issue on Roll20, please email us from the email attached to your Roll20.net account with the name of the game, the date & time your game was last stable, and any details you can provide regarding the loss of data. Delete your account yourself from the My Account page when you are logged into Roll20. Looking to unsubscribe from our mailing list? Click here. If you are having payment issues with your Roll20 account not related to the issues described below, please email us from the email attached to your Roll20.net account so we can help. Declines can happen for a variety of reasons. When we submit a charge to our payment provider, they have automated systems that determine whether or not to accept the charge. These systems take various signals into account, such as your spending habits, account balance, and card information like the expiration date and CVC. The best thing for you to do is follow up with your bank to see why the charges might have been declined. Use this link to update your credit card information. At this time, we cannot automatically change your payment method to PayPal on an active Roll20 subscription. If you are interested in switching your payment method to PayPal, please email us from the email attached to your Roll20.net account so we can provide manual assistance. Log in and see our Supporter Page to discover all of the advanced features available in a Plus or Pro account. Are you a Pro user looking for your free tokens? Head to the Marketplace to view all of the items available to you. Worried about your loosing your art if your subscription expires? Good news, none of your images will be deleted! They will remain in your account, but you will not be able to upload anymore until you delete enough to go below your quota. You can check your quota from your My Account page and learn how to remove items from our Art Library wiki. In order to use Dynamic Lighting, games must be created by a Roll20 Subscriber. While this advanced feature can only be added to games by a Pro or Plus user - their players will all be able to use Dynamic Lighting in-game. Visit our Subscription FAQ for specific subscriptions questions or email us from the email attached to your Roll20.net account for additional assistance. Please email us from the email attached to your Roll20.net account so we can help. You may request a refund for any Roll20 Marketplace purchase by emailing us for any reason within 15 days of purchase. Please note, refunding any game module or add-on will remove your games which have this content installed. Refund requests for products which have enabled downloads of their content will be subject to the Download Restricted Refunds policy. Creators have the option to allow for downloads of their Marketplace assets. All downloadable content will be subject to Download Restricted Refunds. When choosing to download content (images, PDFs, etc) from the Roll20 Marketplace, you waive your right to a refund unless you can show that the content is either broken or does not match the expectations of the product description. Interested in joining our Marketplace? Please review our Becoming a Creator page. It will provide you with all of the answers you seek, including technical specifications and other vital information. When you are ready to apply please email us, making sure to attach several individual .jpg or .png files for us to review. Please do not share links or attach .zip folders or files over 15mb. Comments, Concerns, Questions, or Suggestions? Please follow the steps in our Solving Technical Issues or Video and Voice Chat Troubleshooting wikis. If you make it to the last step (the console log) and your issue still isn't solved, please create a thread with your console log in the Bug Reports Forum, so our developer team can continue to help. Do you have a suggestion on how to improve Roll20? Visit our Suggestion forum & submit your idea to our community. This forum uses a Voting system to display the most popular suggestions. Confused? Need help with something specific? Try the Specific Use forum! Search through old threads or start a new one to get tips & tricks on how to use Roll20 from the community. Put your computer savvy skills to the test! Pro users can explore Roll20's Application Programming Interface or API. Get started with our API wiki or head to the API forum for help. Due to the amount of different systems, Character Sheets are generally not created by Roll20. Various members of the community have done the programming and the code for their Sheets lives on our GitHub repository. Anyone from the Roll20 Community who is comfortable with HTML/CSS is welcome to submit a sheet for approval if their game system is not already represented. If you need help during the building process, check out our Character Sheet wiki or head to the Character Sheet forum. Visit the Looking for Group forum and create a thread to recruit new players or join a party. Welcome to Roll20, we hope you enjoy your stay here! If you are completely new to tabletop gaming, take a look at our Introduction To Tabletop RPGs wiki or jump into our New to Roll20 thread on the forums to ask a question. Ready to jump into the Virtual Tabletop? Start with our Tutorial - it will take you through the basic tools & features available on Roll20. Use the Roll20 Looking for Group tool as a player to search for games to join or use it to list your upcoming games if you are a GM in need of a party. You can also use the Player Directory to search for individual players looking for games, find others to form a party, or list yourself as a player looking for a home. 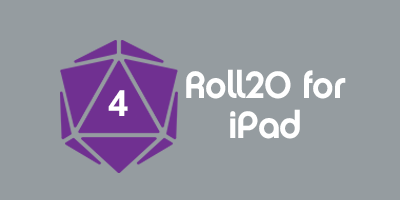 Roll20 for iPad and Android tablets is free-to-use mobile application focused on player-specific portions of Roll20 - that includes: digital dice, character sheets, handouts, and rules (Compendium). Android 4.4 or higher or iOS 6.0 for Apple products on a 7" or larger tablets - at this time, our app is not compatible with smart phones. Having issues with Roll20 for iPad or Android on a tablet? Submit your bug report to the Roll20 for iPad and Android forum. Roll20 Subscribers can access the full features of Roll20 via an Apple or Android tablet. If you are a Subscriber and need support, please see our Roll20 Table on Tablet Support wiki for help. This page was last modified on 12 April 2019, at 14:16. This page has been accessed 95,996 times.